Dubai is known for pushing new construction boundaries, from 3D printed buildings to man-made islands. Next up on the city’s innovations list: a rotating 80-story skyscraper where the residents can view sunrise and sunset from the same window. Named the Dynamic Tower, the 1,273-foot tall building will have floors that spin 360 degrees in either direction for a complete city view. The idea came from Dynamic Architecture’s David Fisher, who first conceived the idea of a rotating tower while working in New York’s Olympic Tower. He originally proposed the tower in 2008, but construction was put on hold. In another construction first, each floor will be made of prefabricated units assembled offsite and later attached to the tower. The Dynamic Tower will have a central concrete core. Residents will access their apartment by stepping onto a slowly rotating floor. Each unit will use the latest in voice technology and allow the apartment resident to spin their apartments for the optimal view from its floor-to-ceiling windows. The independently moving units will rotate without vibration or sound. Other innovations include wind turbines stationed in the gaps between the units. The turbines will produce enough energy to power the building when combined with rooftop solar panels. Dynamic Architecture estimates apartment units will range from $4 to $40 million. The tower will add to Dubai’s skyline by 2020 just in time for the World Expo. 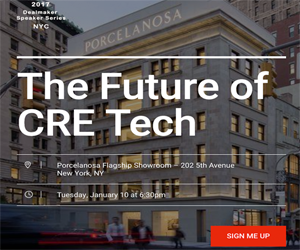 Newer PostThis CRE Tech Cycle is Ending!